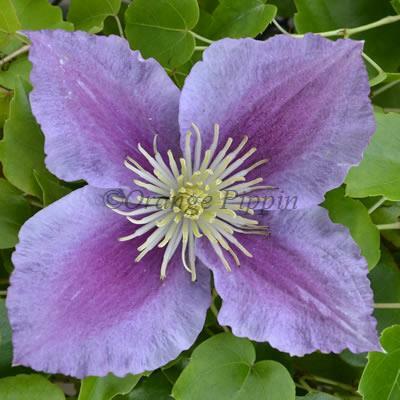 Clematis 'Piilu' is a variety which produces two different kinds of flowers. During May and June the most lovely semi-double pink flowers with a darker pink stripe to each petal and yellow centres are produced, then in September single equally attractive blooms are borne. A very free flowering Clematis producing masses of flowers during both intervals. This non-evergreen climber is an absolute delight planted in the garden up a trellis, along a fence or wall, or planted in a container on the patio supported by bamboo canes or an obelisk. Clematis 'Piilu' was raised by Uno Kivistik of Harjumaa, Estonia. The name means "little duckling".